While visiting Cisco Live in Milan this week, I was honored to present at the Cisco’s “Engineers Unplugged” show. Together with my Italian college and personal friend Fabio Chiodini we drew up a relatively new architecture for shared storage. In this session we showed how you can basically use servers with local storage attached to deliver shared storage out of a software layer. There are many products out there today that use this storage architecture. 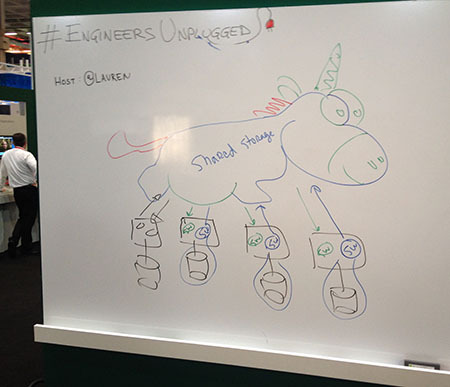 During Engineers Unplugged we only described the architecture and didn’t really go into specific products. Been practising on the Unicorn – Could have been greater, but ey! VMworld Bacelona 2014: Limits lifted, cool technology at your fingertips. And we’re back at VMworld Barcelona! Overlooking the ever-crowded Hands-on labs I’m writing this piece. Crowded even on partner day. That can only be called a success and VMworld is still waking up! If you’re at VMworld Barcelona, be sure to stop by the HoL and play with all the new cool toys! It will be interesting to see what VMware and partners have in store for us this time round. With EVO-RAIL getting a lot of attention, all hyperconverged startups better get ready to go above and beyond what I think will quickly become the “defacto standard” if they fail to hop on to the next level. Staying ahead is key if not vital to them, and I cannot wait what the various startups have come up with to secure their success for time to come. Next to hyper-converged there is immense focus on cloud. The VMware Cloud solution is more and more becoming a complete solution to customers cloud needs. Add the EMC and Pivotal solutions into the mix, and we are finally getting where we have been promising to go: A digestible yet versatile well-run hybrid cloud. The journey to the cloud is still relevant, and the Software Defined DataCenter is the way to get there. With this complete solution (just look for EMC Hybrid Cloud or EHC) you can build scary things in extreme short amounts of time. I was involved in a Prove Of Concept for a large bank in the Netherlands where we constructed a fully functional and actually working EHC solution literally from scratch in just TWO WEEKS! Integrated with EMC storage, EMC Avamar backup and several third party vendors. All in two weeks. That should actually say it all…! Finally I see a lot of focus on VDI and end-user computing. Awesome stuff, the VMware solutions around end-user computing have always been a strong proposal and they don’t seem to be slowing down. With the biggest issue in VDI still being (storage) performance, I encourage you to look at EMC’s XtremIO. XtremIO is not just any full-flash storage array, but it is designed very cleanly. Most important, where others stop at performance and maybe some cool storage services like dedupe, compression etc XtremIO is primed to go all the way into the SDDC. Don’t let your “super fast all-flash array” become the next silo in your datacenter! Ow by the way did I mention that the VMware Hands-on Labs are running on top of XtremIO again this year? The rate on which they spit out new VMs to support all of the sessions here… Just amazing. We live in IT (Interesting Times). How cool is this: EMC’s Recoverpoint goes INSIDE vSphere! EMC’s Recoverpoint has always fascinated me. The technology that manages to split writes out and use those to journal these writes and replicate them is awesome technology. Unfortunately as with many cool technology features, it was complex and prone to error if not doen exactly right. Today EMC announced something that makes very cool technology WAY MORE cool: Recoverpoint will sit inside the hypervisor. What you can do then is mind blowing! A very exciting announcement was made at VMworld today: EVO:Rail. I’ve known for a while about this under the codename “Marvin” (and EMC’s appliance related to this codenamed “Mystic”), now it is out there with it’s official naming. But what is it? Disclaimer: I work for EMC, but what I write here are my own opinions. First we had converged infrastructure. Converged infrastructure operates by grouping multiple components together into a single, optimized computing package. Components of a converged infrastructure may include servers, data-storage devices, networking equipment and software for IT infrastructure management, automation and orchestration. VCE’s Vblock is a prime example of converged infrastructure. Below that we have reference architectures like EMC’s VSPEX and NetApp’s Flexpod. Oh no. VMware just announced a huge change in names. I know “vCAC” wasn’t the best as in many languages CAC means… well you look it up. But vRealize… Really??? Software-defined Storage = Virtualized Storage = vSAN? I recently get more and more into discussions around Software-defined storage and storage virtualization. Is it the same, is it partly the same, is it something totally different? In this blog post I’ll try to shed some light on the technologies of today around these buzzwords and try to make some sense at the same time. Before we launched the idea of the Software-defined Datacenter (SDDC) and Software-defined Storage (SDS), we were already putting hardware between storage and hosts creating an abstraction layer between the two. Good examples of this technologies are IBM’s SVC and EMC’s VPLEX. Software-defined Storage: Fairy tale or Reality? Nowadays the air is filled with the Software-defined Datacenter or SDDC for short. The idea behind this is awesome: As soon as we are able to define and manage compute, storage and networking using software only, we can define, build, scale and destroy virtual datacenters at the press of a button. On top, there’s a web portal. Underneath, there is just a generic x86 hardware platform. Software-defined compute is something that has been going on for years already. Most vendors that sell hypervisors, especially VMware have a lot of work into the software-defined pillar that is called “compute”. Honored to be awarded vExpert for 2013 ! With that, I feel that I must make a promise to pick up blog posting again. I have a new and shiny homelab, and I have been aching to do more cool deepdive stuff as well as some revisiting (for example – Performance impact when using VMware snapshots is dieing for a revisiting on vSphere 5.1 and vSphere .next – but a lot of work). Thank you all for reading VMdamentals.com – hoping to add more cool stuff soon!